I have to give another shout out to the amazing Alicia Pope of Eat Your Way Clean for sending in yet another lovely recipe! Her food is always so flavorful and healthy, you feel great after you eat it. This recipe is amazing, though my attempt to make and photograph it was a little more Mr. Magoo meets the oompa loompas and a little less Martha Stewart. *I left out the jicama on account of a food allergy, and it was still delicious. Clean eating adapts much more easily to a reduced waste lifestyle and the plastic free challenge, but it also makes you realize we wrap some insane things in plastic these days. The produce section at Whole Foods and various grocery stores are overflowing with plastic, even on items that come in their own peels and husks. NO ONE EATS THE AVOCADO SHELL, WE DON'T NEED TO PROTECT IT WITH PLASTIC. I have an upcoming post about how to ease your culinary transition into a reduced waste lifestyle, but I digress. 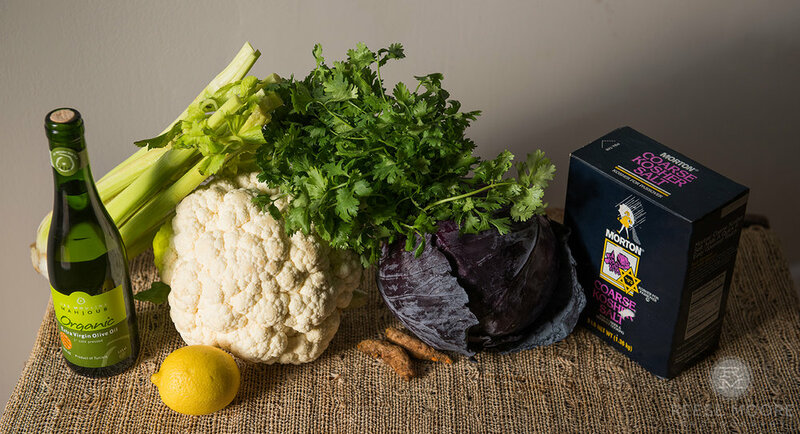 FARMER'S MARKET TO THE RESCUE! Literally everywhere else had my cauliflower swaddled in cellophane, and a loving shout out to the Lowcountry Street Grocery for this celery, though your local farmer's market likely has it as well, as does Whole Foods, I believe. Things were going so well... until I read, "Turmeric". 1) My mother is the turmeric lady. Headache? Eat some turmeric. Cut on your arm? Turmeric! Parking ticket? If you'd followed her advice and eaten some turmeric, this probably wouldn't have happened, you fool. 2) What the hell is turmeric? And isn't that always dried? Spices presented a particular problem when it comes to the Meals without Plastic Challenge, at the time I made this recipe, though I've solved that problem since then thanks to Jen's Pumpkin Chocolate Chunk Bread. 3) Ok, ok, ok, off to Earth Fare. They probably have that stuff fresh, I mused. Cheaper than a spray tan. And not even Trump orange. You will legit turn into an oompa loompa. Your wooden cutting board will turn orange. Your knife will temporarily turn orange, your sink will turn orange, your entire house will look like the inside of a Cheeto. And your hands will stay orange for like, 3 days. So next time you're considering that spray tan, ladies of IOP, head straight for the produce aisle. 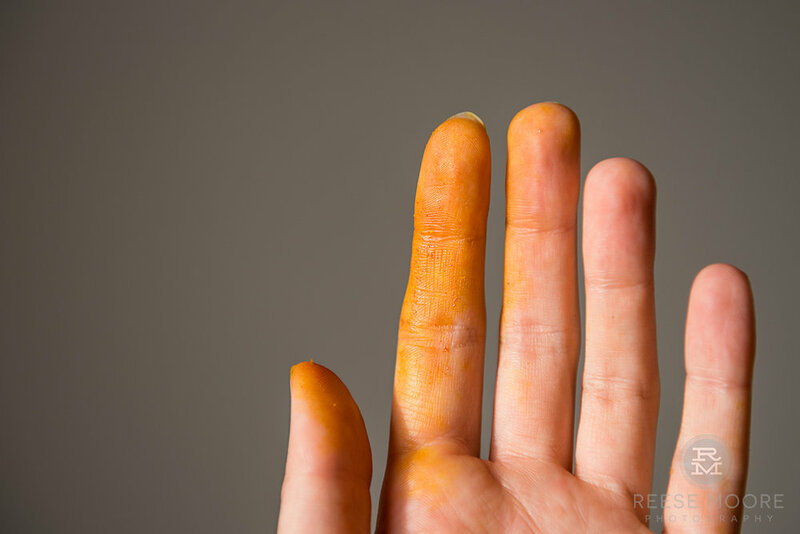 Turmeric: it's nature's answer to the spray tan. Back to the recipe notes. Basically, you chop the ingredients, layer them, and bake. It's so easy! And the creamy avocado cilantro sauce is heaven on top. 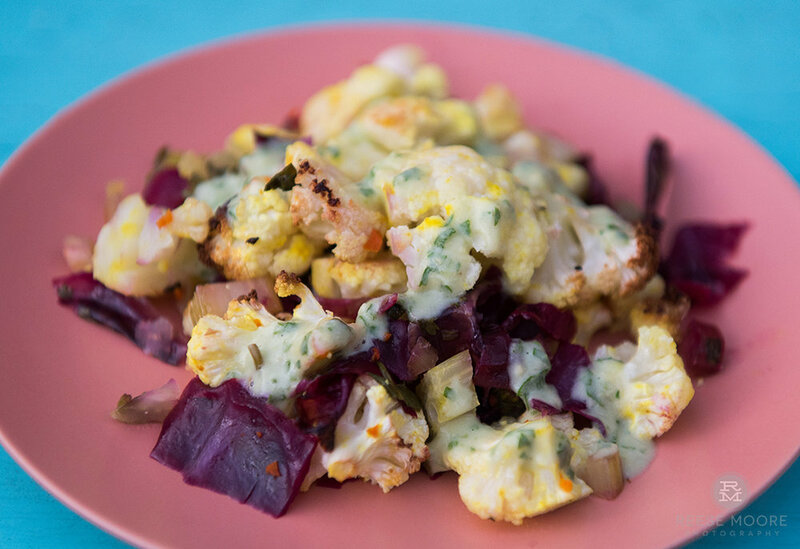 It's beautiful and delicious, things I never thought I'd say about cauliflower as a child! I loved Alicia's suggestion of putting an egg on top for breakfast, too. Check out the full recipe on Alicia's site here. 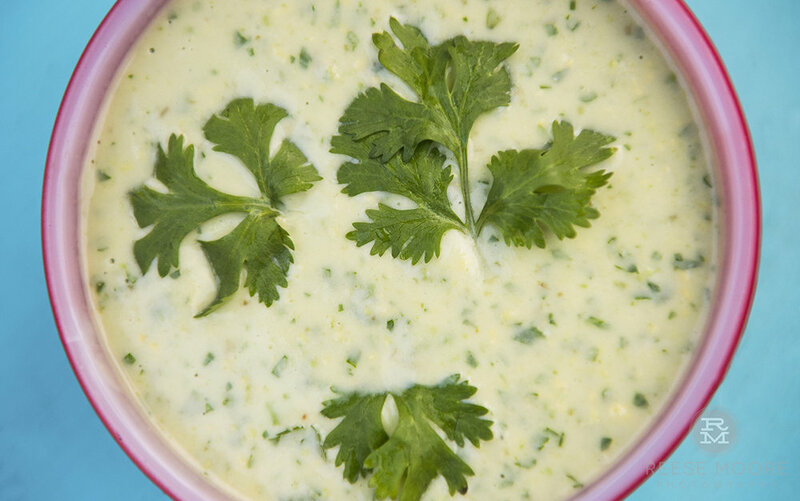 What's this creamy avocado cilantro sauce I'm raving about? It's an easy to make, cellophane and plastic carton-free condiment from the gods. I used the leftovers on like... everything. Take that stuff, run it through the blender, and voila! At the end of this recipe, I had one can to recycle. The rest went into the compost! It felt SO GOOD. While much of plastic food packaging is not recyclable or doesn't recycle well, there is some hope for food-grade plastic recycling! Check out this article to learn more! And for a gentle remind why we all urgently need less plastic in all areas of our lives, I strongly recommend watching this NPR video, as sent to me by a dear friend. If you're eating oysters or clams, you are eating plastic now, my friends.